E-Z Up's versatile Instant Table System was built with artists in mind. Use one table for a sturdy, dramatic display — or connect several to create stackable towers, multi-height tables and more. The 22¾" × 22¾" (58 cm × 58 cm) table supports a distributed weight of 175 lbs (79 kg). 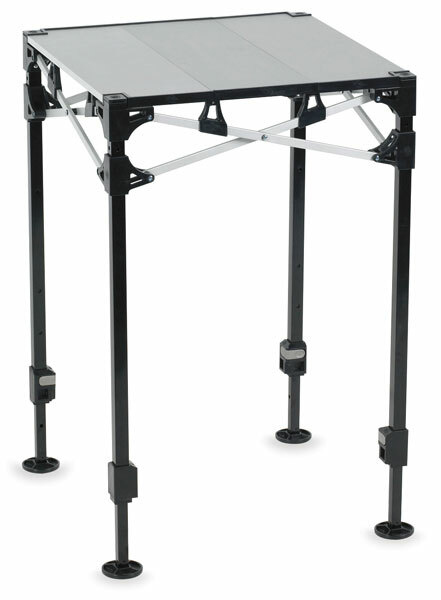 The 22¾" × 45¼" (58 cm × 115 cm) table supports 300 lbs (136 kg). 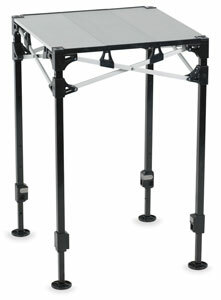 Both models feature an aluminum top, locking connectors, soft-surface footpads, push-button toggles, and three height adjustments: 31" (79 cm), 35" (89 cm), and 42" (107 cm). ® E-Z Up is a registered trademark of International E-Z UP, Inc.™ Instant Table is a trademark. Instant Table, 22¾" × 22¾"